Animation adds detail and artistry to a promotional product launch video. The launch of any new product requires proper promotion in order for it to succeed in the market. When promoting a new product, great care needs to be made to familiarize the customer with the product while motivating them to learn more. One of the most efficient ways to both inform and intrigue is through video and animation. The producers of the No Bite V, an oral and nasal intubation aid, understood this and needed a custom sales video to demonstrate how their new medical device worked and why it should be used in medical facilities everywhere. Dynamic Digital Advertising would provide video production services to create a unique sales tool that engaged and educated the viewer. Through the use of 3D animation, DDA would produce a promotional tool that demonstrated the unique features of a new medical device. This device protects both patients and medical equipment when oral cleaning or tracheal suctioning is needed. 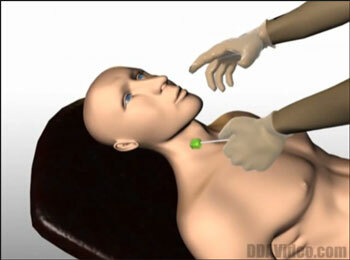 The animation would show how the caregiver administers the device and how the patient may respond. The No Bite V animated 3D video details the proper use of the device through five common application scenarios, including oral cleaning or tracheal suctioning. Custom 3D animations of the device in use were integrated with voiceover narration that were recorded and edited in DDA’s recording studio. Supporting text and graphics were also combined with on-screen appearances by the inventor to fully describe the device and its benefits. There is also an animation showing a magnification of the guide on the No Bite tool. The finished video was formatted for DVD, providing a professional and polished product launch presentation. 3D animation offers the detail and artistry ideal for engaging and informative presentations like the No Bite promotional video. Using this medium made for an effective product launch and sales video to notify members of the healthcare community of this new and important device.